“Visiting Los Angeles without a car is impossible!” numerous L.A. residents had warned me. I stubbornly disagreed! My friend and I had intended to rent a car for at least a couple of the six days we spent in Lala land, but some unexpected financial obligations at home meant that our already-booked L.A. vacation would be an extreme budget trip. That meant no rental car – we’d rely on public transportation for the entire thing. No problem. Extreme budget trips are right in my wheelhouse. Despite the warnings, I knew that seeing the City of Angels by bus and train was entirely doable, as long as we stayed somewhere near the #704 Santa Monica Blvd. bus line. 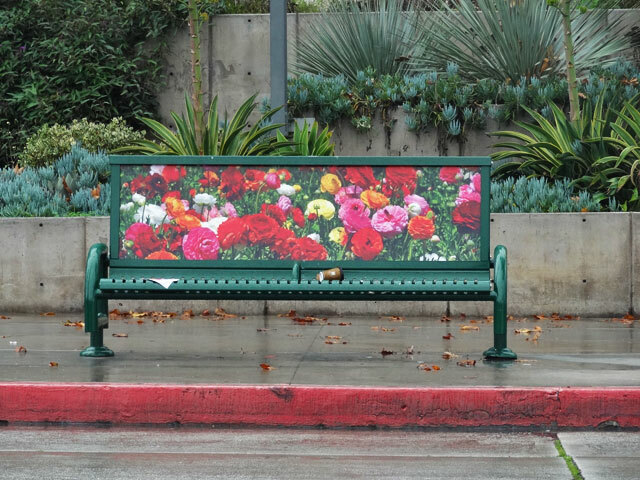 This awesome bus route runs through downtown, Echo Park, Silver Lake, Hollywood, West Hollywood, Culver City, Beverly Hills, and all the way to the ocean at Santa Monica. Your mileage may vary, but for me, 90% of the places worth seeing in L.A. are accessible via this bus. The basic route of the 704 bus. We did a great deal of walking, deciding that if any destination was less than 4 miles away (that’s a one-hour walk), we’d get there by foot. The whole point of this trip was slow travel, so we had all the time in the world. Under these circumstances, a 4-mile walk was nothing. In fact, it was a great opportunity to exercise in the beautiful southern California sun and see more of the city. 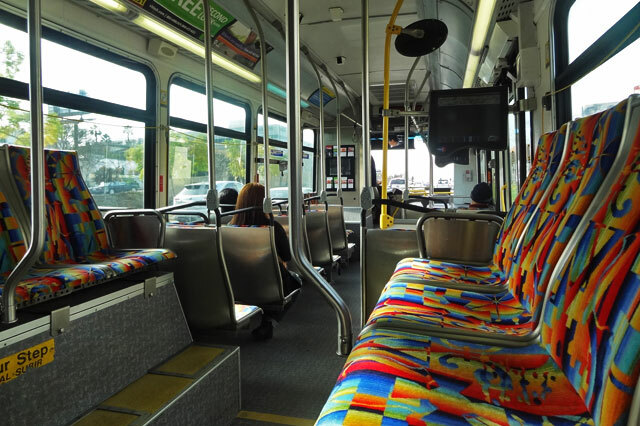 L.A. residents had warned me that the bus and subway are full of vagrants. I don’t doubt that’s the case sometimes, but I saw no evidence of that during my week. While there were no businessmen in suits on the bus, as you’d see in New York and Chicago, there also weren’t any especially scary people, either. I mostly saw regular working-class folks and never felt unsafe or out of place. The subways were a little more unsettling, since in the evening there simply weren’t very many people down there. So we mostly stuck to the bus rather than the train. Aside from one night where we found ourselves without a bus home (story on that coming later), spending a week in Los Angeles sans vehicle wasn’t very difficult. We made it to all the neighborhoods we wanted to see. From the airport, a shuttle took us downtown, and from there, we hopped a bus to our Roomorama host’s home in Silver Lake. The next day we caught the #704 to Hollywood, and from there an easy walk led to Runyon Canyon for some hiking and celeb-spotting. In Santa Monica, we hopped a bus for a short ride down to Venice to check out that quirky beach community. Almost every commute was a breeze. 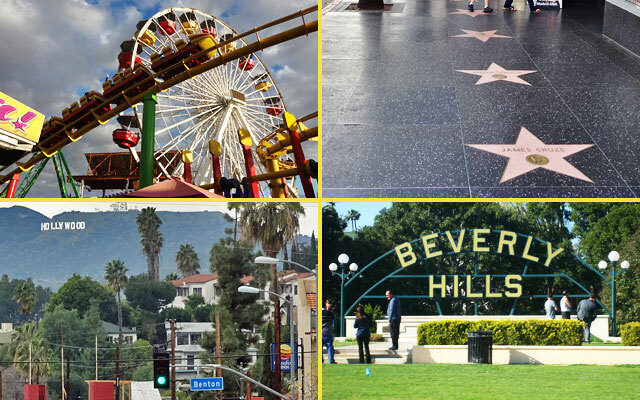 Spots easily accessible from the #704 bus route (clockwise): The Santa Monica Pier, the Hollywood Walk of Fame, Beverly Hills, the Hollywood sign as seen from Echo Park. The only time we used a car during the week was when our Couchsurfing host drove us up to the Griffith Observatory one evening. But even then, we could have taken the Observatory Shuttle, which runs on Saturdays and Sundays and costs a whopping 50 cents each way. There really is no reason why L.A. visitors can’t get around by public transit. The commutes may be time-consuming, but that would probably be true even if you have a car, right? Walking = exercise, sun, and a good opportunity to see the city. So do it! The amount of money you’ll save by skipping the rental car is huge. The bus here is cheap – just a dollar-fifty for a ride! A seven-day transit pass costs $20, or the price of a typical cab ride. One cab ride versus an entire week of buses? I know which one I’m going with. And then of course there’s THE TRAFFIC!!! Los Angeles has the worst traffic in America, but the buses avoid the worst traffic headaches because they don’t travel on the highways. And even when traffic does slow down, I’d rather be on a bus with the ability to read a book or play on my phone than stuck on a freeway with no hope of moving anytime soon. The other awesome thing about L.A. transit is the Metro cell phone app, which pulls up a list of all the buses that will be arriving at your location within the next several minutes. There’s no guessing about when the next #704 will be arriving when you have the app. So why does everyone who lives in L.A. insist that it’s not possible to get around here without a car? I’m not quite sure. I suppose it’s because Angelinos just aren’t used to taking the bus, so they write it off without even considering it. So it’s definitely reasonable to visit Los Angeles without a car. Is it possible to live in Los Angeles without a vehicle? The answer, again, is yes – if you’re really committed to the idea. You’d probably need to live near one of the primary bus lines, and you may want to own a bicycle. 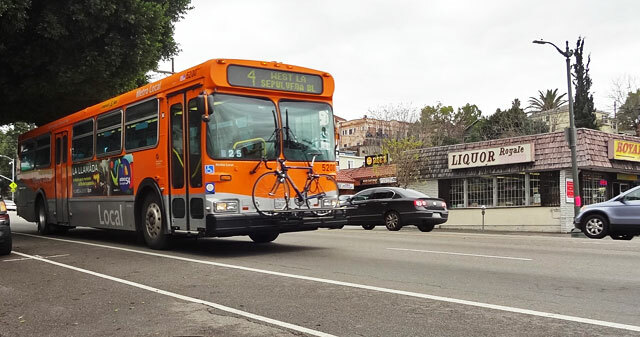 L.A. is not a particularly bike-friendly city, but there are bike lanes in West Hollywood, Silver Lake, Culver City, and several other neighborhoods. Bike rental companies are also an option, though they’re not as abundant as in other major cities. Of course, these days, with Uber and Lyft, you can get around easily and reasonably cheaply in any city like Los Angeles. It has never been easier to live in LA without a car! 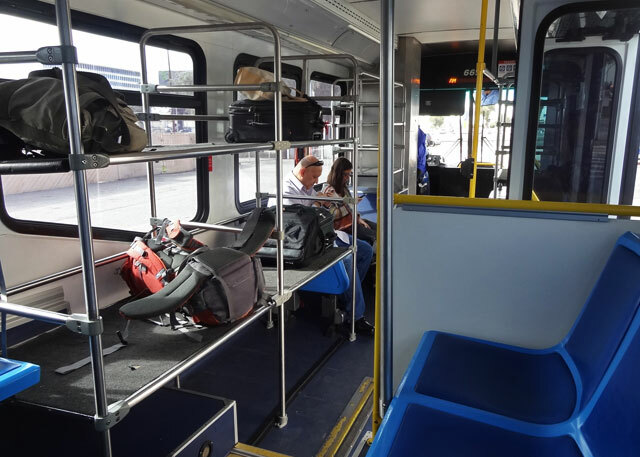 The bus to LAX with the baggage rack. So, yeah. Los Angeles. Totally doable without a car! I appreciate your tip about how you stuck to riding buses versus the train while you visited the Los Angeles area. My husband and I have always wanted to travel there and see the sites of Hollywood. We’d love to take a tour from someone who’s familiar with the area and can give us the back story of some of the sites. We’ll have to remember your tip about using the buses if we do ever make it out there. This myth that LA is unvisitable without a car is something that has really put me off going there, to the extent that I had it on my mental list of ‘places I never want to visit’. My partner has been before and would quite like to go back with me, but I’d just said I refuse to go to a place where you MUST have a car to get around, which seems like such an alien idea to me. I knew from television, movies and the internet (reliable sources that they are) that there was a bus and metro system in LA, so I assumed it would be possible to get around using those, but everyone told me otherwise. Thanks for proving them wrong. I may consider taking the city off that list now. Hey Sam, I think many people who live there just assume that no one would make the effort to utilize the bus system, so in their minds it’s “not possible” to get around by public transit. It is definitely feasible if you do your homework! It’s great you had an overall positive experience. My son went to school at UCLA Law and so we spent a lot of time in southern CA, driving anywhere near there is stressful at best. Seeing L.A. without a car was good because unless you’re used to the insane traffic and know exactly where to turn next…. Yikes! Not fun! Right, I did get a break by not having to put up with southern Cali traffic. Those drivers are always in a hurry out there! Ohmygod, don’t ride a bike in LA!!! I’ve seen lots of people hit by cars when riding. It’s not fair, but it happens. And it’s scary. I swear some of these bike riders have a death wish with the way they ride their bike. Maybe this anti-bike atmosphere will change one day. I wouldn’t want to ride a bike in most of LA, but the neighborhoods that have bike lanes might be okay, right? I’m glad to hear you would recommend L.A. transit as well – it’s so affordable! I’m a great believer in using public transport where ever i go and I’m glad to see that it’s utterly possible to explore LA by bus and on foot. Great stroy and great information. I’ll spread the word. Thanks Inka. I also love using public transportation whenever possible.